Wiki currently contains 2,869 pages. Glenelg's overall longest winning streak is against Sturt - 17 consecutive wins. Adelaide 5, Central 11, Eagles 4, North 13, Norwood 8, Port 8, South 8, West 14, Torrens 7, and Woodville 14 . See: Records vs individual clubs for further records. Dennis Keith ("Fred") Phillis holds the Glenelg all-time goal kicking record. Phillis is the brother of Wayne "Butch" Phillis. Phillis was nicknamed "Fred" when his schoolmates likened him to the most famous Test cricket paceman of the day, 'Fiery Fred' Truman of Yorkshire and England. The nickname stuck and to many SANFL fans he is only known as "Fred" Phillis rather than by his birth name. "Fred" began his senior career with Glenelg in the SANFL in 1966 as a centre half back but was moved into the Centre half-forward, and later Full-forward, positions by incoming 1967 coach Neil Kerley. This lateral thinking paid off with Phillis kicking a then SANFL record of 137 goals in 1969. 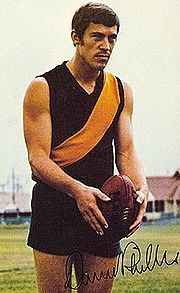 He polled 18 votes in the 1969 Magarey Medal to be the first player to win the medal having played chiefly at full forward for the season. In perhaps Glenelg's most memorable non-finals game, Phillis scored 18 goals at Glenelg Oval in 1975 as part of the team's record-breaking 49 goals against Central District. Quirkily enough, in the 1973 grand final win by Glenelg over North Adelaide he failed to goal. Phillis is the highest goal scorer in the history of the Glenelg club. This is all the more remarkable when considering that former league leading goalkickers Jack Owens (1927-1928, 1932) and Colin Churchett (1948–1951) are also Glenelg champions. Overall Phillis is third on the all time SANFL goal scoring list. After retiring as a player Phillis continued to pursue his chosen career as an architect. "Fred" Phillis is credited by the SANFL with scoring more than 100 goals in a season on three occasions. Glenelg records show him as having achieved this feat on five occasions (see: Honour Board). In 1971 the SANFL recognised (for a time) Fred Phillis’s total of 102 goals because he scored three goals in a bodgie end of season knockout trophy known as the Coca-Cola Cup for teams which missed the finals. Later, however, the league put his total back to ninety-nine. In Glenelg records he is shown as scoring the century tally three years in a row and five times in all. In the league records based on premiership matches he achieved the mark three times.